October 25th will mark the 600th anniversary of the Battle of Agincourt, one of the most famous battles of the Hundred Years War. In this issue, we take a look at how the story of the battle has been written over the centuries, and answer why the English longbow was such an effective weapon in the Later Middle Ages. You can also read about the possible discovery of one of Henry V’s warships, and read reviews of the movie Macbeth and TV series The Last Kingdom. 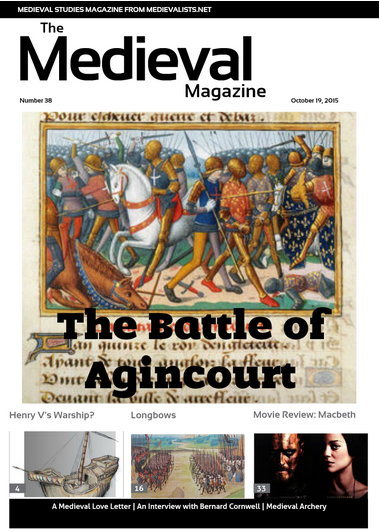 Here is the story of the Battle of Agincourt from five different accounts, starting with one from the fifteenth-century. They reveal the changing view of the battle over time, and how historians have reflected on what happened on this battlefield. One of the most feared military weapons of the Middle Ages was the longbow, used to legendary effect by the English in The Hundred Years’ War. While the longbow has gone down in history as a mighty weapon, what exactly was it and why was it so effective? Has one of Henry V’s warships been discovered? Here are five fun facts about medieval archery which you can use to impress your friends.